After receiving stinging criticism from his Androni Giocattoli-Venezuela team manager Gianni Savio for pulling out of the Giro d’Italia, Jose Rujano has now said that mononucleosis was the reason for his failure to perform in the race. Rujano said that he underwent tests at the Vialarda di Biella clinic in Italy and that these have explained the reason for his lack of form. "I knew something was not right. I prepared very well for the Giro, to give satisfaction to my followers,” he said in a statement. “Physically it was not right. Rujano previously competed with the team from 2003 to 2006. 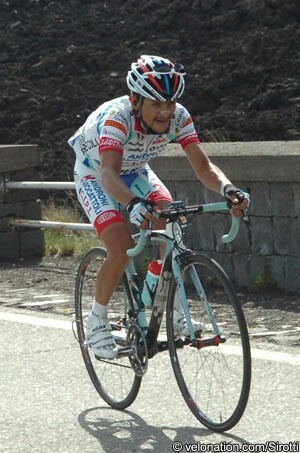 After his strong ride in 2005, he went into the following year’s race as one of the favourites. However he was in dispute with the team over his contract and wanted to move to Quick Step; an agreement was reached whereby he would ride the Giro d’Italia, then transfer across, but he withdrew during the Italian event. Several years of quiet performances followed, but he returned to form when he rejoined Savio’s team last year. At the time the Italian team owner said that he knew how to get the best out of the rider. The Androni Giocattoli-Venezuela team took part in the Giro d’Italia thanks to a wildcard invitation. It is not scheduled to ride the Tour de France. Rujano has said that his next target is the Olympic Games. “I will recover from this virus and will remain the same strong rider,” he said. “I never thought something would happen to me in the Giro. God knows why these things happen."